Atlanta Technology Leaders interviewed Denise Reese and Jay Ferro of Women In Technology (WIT) to announce upcoming signature event: WIT Connect. It's the premiere networking event to the technology community in Atlanta - a truly awesome event. 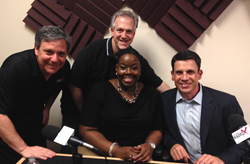 Denise Reese, WIT Foundation Board President, appeared on the May 8, 2014 Atlanta Technology Leaders show with Jay Ferro, WIT Connect Co-Chair, to announce the upcoming signature event, WIT Connect. Women In Technology (WIT) serves as a passionate advocate for advancing women in the technology field. WIT has an upcoming signature event WIT Connect, which will take place June 12, 2014 at the Georgia Aquarium from 6:00-9:00 pm. WIT Connect, presented by Dell, brings together hundreds of Georgia’s leading technology executives and professionals for networking and competitive bidding. Executives from Aaron’s, Cox Communications, NCR, Novelis, SunTrust, and the Weather Company, among others, have donated their time to be auctioned off to the highest bidder. Denise Reese is Director of Business Development with Endava US LLC, a leading IT services and consulting firm. Reese has spent over a decade in sales and strategic alliances for several major IT services and software organizations in the United States and Europe. To learn more about the upcoming WIT Connect event, tune in to this episode of Atlanta Technology Leaders. Each week, we interview Executives, Providers, and Thought Leaders in the Technology community — exploring Trends, sharing Best Practices, and reporting exciting new developments on the Technology scene. Atlanta Technology Leaders, sponsored by Band of Coders, is co-hosted by Stone Payton and Lee Kantor and airs each Thursday at 2:00 p.m. EST.